January is my favorite month of the year, and I am SO excited to share some of my favorite things from this past month! If you know me then you know I absolutely LOVE listening to podcasts while I’m getting ready in the morning or going on a long road trip. 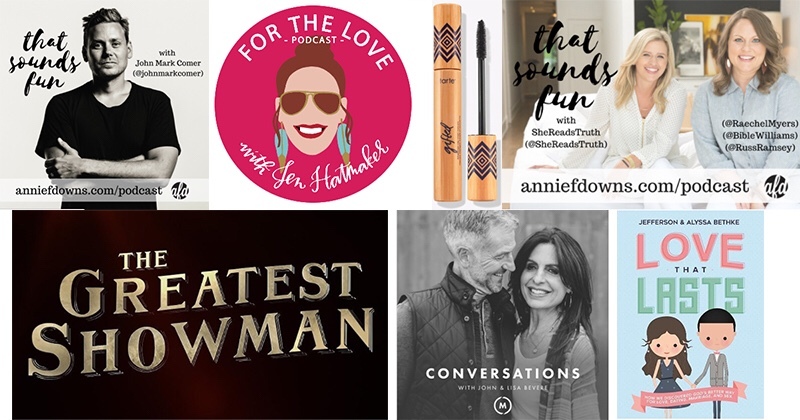 I listened to so many great episodes this month that made me feel ready to tackle the new year with a refreshed mindset, so I have to share those with you first! I am a HUGE fan of John Mark Comer’s writing and preaching, and this podcast episode was an incredible eye-opener for me. I grew up in the church, attended a Southern Baptist Church almost every single Sunday for the first 19 years of my life, and I cannot recall a single sermon, Sunday School lesson, or discussion about Sabbath. It was crazy to me that the act of practicing Sabbath is something so vital to our well-being and an actual command from God to do, yet I haven’t heard much about it aside from the 4th Commandment (Genesis 20:8). This episode made me really analyze my own life and how I can reasonably practice Sabbath as a college student (which I will write about soon). Two major takeaways: why practicing Sabbath is important, and how we can make Sabbath accessible to all people, especially those who are poor. I fell in love with Jen Hatmaker’s podcast back in October 2017, and this had to be one of my favorite episodes she’s made yet. She opened the door for me to discover Rachel Hollis, who is equally as cool and inspiring as Jen, and I just want to be their best friends. My favorite things about these two women are how much they uplift, affirm, and encourage other women. They discuss motherhood, sexual harassment, and the freedom we have in being women of God. This episode was such a blessing, and you better believe I’ll be checking out Rachel’s book, Girl, Wash Your Face (which releases this month!!). I love listening to The Bevere’s talk about faith. It’s so refreshing hearing from a husband and wife who’ve done so many years of hard work and ministry together. I particularly loved this episode because they talk about fasting, another Christian practice that I never had any formal teaching about and have never actually practiced myself. Their teaching of the practice of fasting was truly inspiring, and the perfect episode for me to learn from as I start making my plans for Lent that begins this month (February 14th!). I know, I know, another Annie F. Downs podcast. But hear me out. For the past year, I’ve been all about finding better ways to be intentional with my time and with my life. This episode talks about Lent and fasting and I am here for all of it. Last year, I attempted to complete the She Reads Truth Lent study in Isaiah, and I only got to day 30 (barely). I would skip days then try to make up for them, and I just ended up disappointed with myself by the end of it. But I am determined to set myself up for success this year. I’m working towards finishing 2017’s SRT Lent study in time to begin the 2018 Lent study on time, and this episode has gotten me all sorts of excited for it to get here! I first discovered Jeff Bethke during my freshman year of college, and his writing and speaking was the catalyst for my making my Christian faith my own. I was able to step out of the traditional, rule-following, border-line legalist way of thinking and walk into freedom and grace because of the way he presented his ideas that made me think and learn for myself. I’ve been following him and his wife’s ministry for almost two years, and they have been such an incredible blessing to me. This book was a great read to keep my heart set on God’s design and not my own selfish desires for romantic relationships. I admire Phylicia’s writing and voice so so much, and reading this piece from her made me love her even more. She’s gone to Liberty University, met her husband there, and worked there for years, but she doesn’t let her love for Liberty University silence her from calling out all of the hypocrisy we’re seeing from their president in the realm of politics. 1. Tarte Gifted Mascara– I absolutely hate mascara, but when I saw that Ulta had all Tarte mascaras for 50% when I was home for Christmas break, I had to get one to try out and my life has been changed!! This mascara is lightweight, separates my lashes perfectly, and looks beautiful but natural. I’m also a huge fan of Tarte because they’re vegan and cruelty-free. All of the wins in my book for a makeup product! That’s all of my must-share favorites from this month! Feel free to leave a comment on things you’ve been loving this month, and I really do hope you’ll check mine out if you get the chance!